Our Big Weekend Event is coming soon! or shop our Wish List! 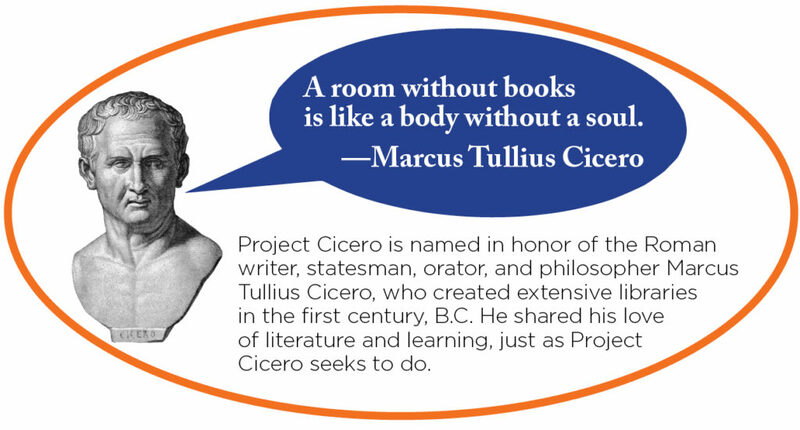 Project Cicero is an annual book drive to help under-resourced New York City public schools create and enhance classroom and school libraries. Looking to address the problem of limited reading resources in New York City public schools, ten women came together with the idea of a book drive and named it Project Cicero. The simple yet powerful premise: collect gently-used books donated by families of independent, parochial and better-resourced public schools and distribute them to public schools in need. The centerpiece of Project Cicero is its annual event where 1200 New York City teachers at schools entitled to Title 1 benefits personally select as many books as they can transport to their schools and libraries! Since its inception in 2001, Project Cicero has distributed 4,000,000+ new and gently-used books to more than 20,000 New York City classrooms, reaching over 1,000,000 students. Donations come from more than 100+ schools as well as generous publishing companies. Thank you! Project Cicero is an all-volunteer 501(c)(3) organization with an all-volunteer board and more than 1000 students, parents, and teachers who assist in every capacity of collecting, sorting and distributing 150,000 books annually. Thank you, too! News Corp and the New York Post.